Kurt's recent posting prompted me to put down here what I've been putting off for a while: my thoughts on BPM and SOA. Hopefully it's apparent to everyone that BPM != SOA: they solve different problems. However, that does not mean they cannot compliment each other. The recent work on combining jBPM with JBossESB should illustrate that, but let's go further. One of the key aspects of SOA is about agility: the ability to react more quickly to changes in the way IT systems need to be deployed and used, as well as being able to leverage existing IT investments. At this level agility is something that is definitely a concern of T-Shirt And Sandle Man, i.e., IT folks and not Men In Suits, i.e., business folks, which is primarily where BPM resides. Where BPM works well is in ensuring that business goals and efficiently aligned with how they are translated into processes, making those processes more reliable, faster and compliant with the businesses policies and practices. Fairly obviously, for business folks, these are just as important as IT agility. BPM promotes a model-based approach to task definitions, which, if used right, should ensure that what the business wants is what they get. Importantly it's defined by the business folks and not by the infrastructure. It encourages a top-down approach to service orchestration and requirements: you don't develop what you don't need. I know this sounds pretty obvious, but you'd be surprised! BPM and tooling are natural allies, as they are with SOA. Remember that SOA is not a product: it does not come in a shrink-wrapped box. So you shouldn't think that it is simply an ESB or some other technology. It is not purely a technology driven initiative. A good SOI will allow the right people in an organisation to take ownership of the components (technology and business) that are important to them. This is one of the reasons why loosely coupled systems work. SOA does not belong to a single group of people (e.g., the typical developer), but to the business as a whole. That's why SOA+BPM work so well together: it is a natural fit. Service Orchestration is the arrangement of business processes. Traditionally BPEL is used to execute SOAP based WebServices, and in the Guide 'Service Orchestration' you can obtain more details on how to use ActiveBPEL with JBossESB. However, if you want to orchestrate JBossESB services regardless of their end point type, then it makes more sense to use jBPM. 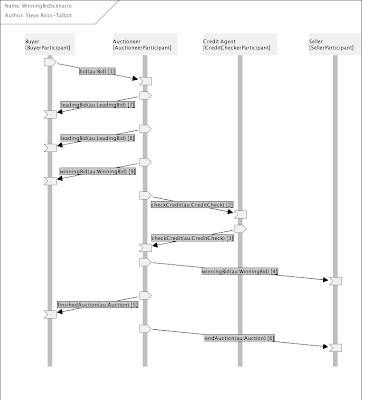 Figure 1 shows an order process in jBPM Designer view which is part of JBoss Developer Studio. In this post we will describe what it takes for you to start using jBPM for Service Orchestration. To create the process definition from Figure 1 you drag in components from the left menu bar. To start you'd drag in a Start node, followed by a regular 'node' type, which we gave the name 'Intake Order'. You can now connect the two boxes by selecting a 'transition', and by first clicking on the start node and then on the Intake Order node. Next we need to tell jBPM which JBossESB service backs this node. This is done by attaching a special 'EsbActionHandler' action to the node and configuring it to go out to the service 'InTakeService'. 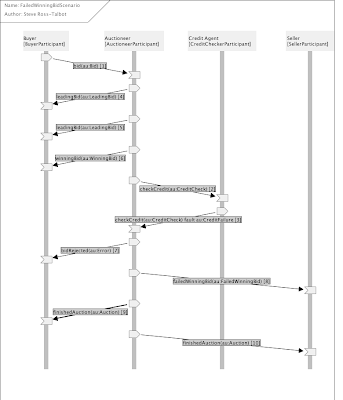 For now you will need to click on the 'source' tab to drop into the XML representation of this node (see Figure 2). The first two subelements esbServiceName and esbCategoryName specifiy the name of the service, where the other two elements: bpmToEsbVars and EsbtoBpmVars specify which variables should be carried from jBPM to the ESB Message and back respectively. Koen Aers has been working on a special EsbServiceNode so all the configuration can be done in design view. Creation of the rest of the process definition goes in a similar fashion, ending with an 'End' node, which when reached will terminate the process. JBossESB deploys the jBPM core engine in a jbpm.esb archive. 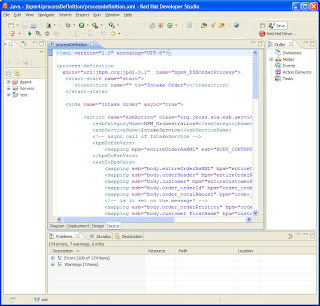 This jbpm.esb archive contains the jBPM core engine as well as the configuration and the jbpm-console. 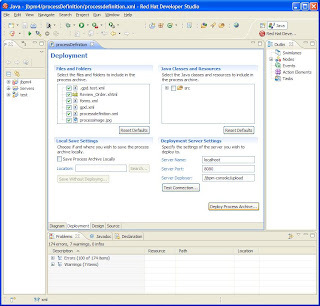 To deploy the process click on the 'deployment' tab in the IDE, selecting the files you wish to deploy and clicking on the 'Deploy Process Archive' button. Besides deploying the process definition we also need to deploy the services themselves. Your services are deployed in a yourservices.esb archive. For deployment order you need to specify a depends 'jboss.esb:deployment=jbpm.esb' in the deployment.xml. Note that deployment of process definitions and esb archives is hot and does not require a server restart. 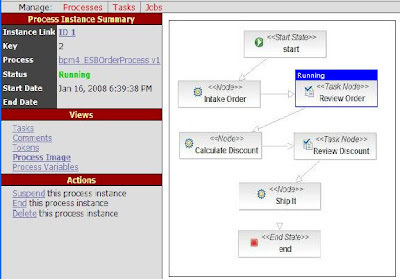 There a multiple ways to start an instance of the process that was deployed in step 2. For instance you can start one from your own code, the jbpm-console, but perhaps the easiest way is to start on using an out-of-the-box service. 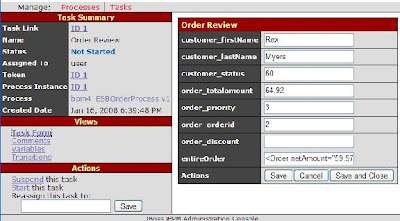 For instance when your store front receives the order you can create an EsbMessage with the invoice and drop it on the 'StartProcess' service. 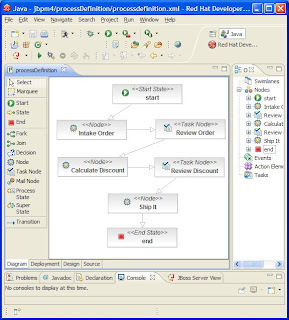 In Figure 4 the 'Review Order' process is highlighted because the process is waiting for a human to review the order. So here we now have integrated human work flow, see Figure 5! We demonstrated that it is a three step process to use jBPM for Service Orchestration and how to integrate it with Human Work Flow. To get more details you can read the jBPMIntegrationGuide. Related to our governance story, you should definitely take a look at the new JBoss DNA project. This got lost in the end of year celebrations. Over 5 years ago, around the time BPEL4WS came out, WSCI was released. Because this was just at the peak of the IBM/MSFT versus everyone else wars the uneducated observer saw this as yet another attempt by Oracle et al to fight the beast. However, WSCI was a far different type of animal. It went to W3C under the guise of the WS-Choreography group and eventually WS-CDL was born. WS-CDL is one of those standards that I've been observing from a far: I was involved at the periphery in the early years of WS-T and OASIS WS-CAF, because of the influence of transactions (and context), but apart from being on the mailing list I've had no further input. But WS-CDL is also one of the nicest, most powerful and most under-rated standards around. So although I've been watching from a far, I've also been waiting for the right moment to use its power in whatever way makes sense. In Arjuna there were limited opportunities for this. I tried with a few of our engagements, but the "Why do I want this when there's BPEL?" question kept coming up. As a result in some ways WS-CDL is also one of the most frustrating standards: you really want to shake the people who ask those questions and force them to read up on WS-CDL rather than believe the anti-publicity. I also wish that some of the bigger players involved in its development had done a lot more. Oh well, such is life in the standards world. However, once I joined JBoss and was put in charge of the JBossESB development, things started to change. Here was a great opportunity! Here was a distributed system that was under development, would use Web Services and SOA at its heart, would be about large scale (size of participants and physical locality) and where you simply did not control all of the infrastructure over which applications ran. Now many people in our industry ignore formal methods or pay lip service to them, believing they are only of use to theoreticians. Unfortunately until that changes Computer Science will always be a "soft" science: more an art than anything. That's not a good thing because it limits efficiency. In a local application (everything on one machine) you can get away with cutting some corners. But in a distributed system, particularly one that needs to be fault tolerant, it's worse. For example, how do you prove the correctness of a system when you cannot reason about the ways in which the individual components (or services) will act given specific expected (or unexpected) stimuli? Put another way, how can you ensure that the system behaves as expected and continues to do so as it executes, especially if it has non-deterministic properties? As the complexity of your application increases, this problem approaches being NP-complete. Rather than just throwing together an "architecture" diagram and developing services in relative isolation, and trusting to luck (yes, that's often how these things are developed in the real world), we decided that something better had to exist for our customers. Now there are formal ways of doing this using PetriNets, for example. WS-CDL uses Pi-Calculus to help define the structure of your services and composite application; you can then define the flow of messages between them, building up a powerful way in which to reason effectively about the resultant. On paper the end result is something that can be shown to be provably correct. And this is not some static, developer-time process either. Because these "contracts" between services work in terms of messages and endpoints, you can (in theory) develop runtime monitoring that enhances your governance solution and is (again) provably correct: not only can you reason successfully about your distributed system when it is developed and deployed initially, but you can continue to do so as it executes. A good governance solution could tie into this and be triggered when the contract is violated, either warning users or preventing the system from making forward progress (always a good thing if a mission-critical environment is involved). Now this is complex stuff. It's not something I would like to have to develop from scratch. Fortunately for JBoss (now Red Hat), there's a company that develops software that is based on WS-CDL: Hattrick Software, principle sponsors of the Pi4 Technologies Foundation. Fortunately again, one of the key authors of the standard (my friend/colleague Steve Ross-Talbot) is both CTO of Hattrick Software and Chair of the Pi4 Technologies Foundation. Steve has been evangelizing WS-CDL for years, pushing hard against those doors that have "Closed: Using BPEL. Go Away." signs on them. We're starting to see the light as users see the deficiencies of BPEL (the term "Use the right tool for the right job" keeps coming to mind) and look for solutions. But it's been a long, slow process. But when like minds come together, sometimes "something wonderful" can happen. People at Hattrick have been working with us at Red Hat for several months, to integrate their product (which is open source and lets you develop scenarios to test out your deployments and then monitor them for correctness once they go live) with JBossESB and the SOA Platform. This work is almost complete and it will offer a significant advantage to both companies customers. We're hoping to offer a free download of the Hattrick Software for the SOA Platform in the new year, and maybe even for the ESB. Since it's all Eclipse based, it should be relatively straightforward to tie this into our overall tooling strategy as well, providing a uniform approach to system management and governance. But even without this, what this combination offers is very important: you can now develop your applications and services and prove they work before deployment. Furthermore, in the SOA world of service re-use, where you probably didn't develop everything, a suitable WS-CDL related contract for each service should allow developers to re-use services in a more formal manner and prove a priori that the composite application is still correct, rather than doing things in the ad hoc manner that currently pervades the industry.